The main idea behind ParamDrum is to have a fun and fast way of not only prototyping beats, but of creating variations that can be saved and recalled either in live performance or recorded and arranged into the backbone of a track. it’s red. Wow, is it red. Say, did you notice that it’s red? new morphable sample sets. Morphable? Yes – they’re grouped into sets of ten to twenty samples that gradually fade between two sounds, perfect for using with the sample select automation recorder. It’s available here. The password is the same as for the other files. Don’t have a password yet? It’s a measly old $15.00, a bargain, a steal. 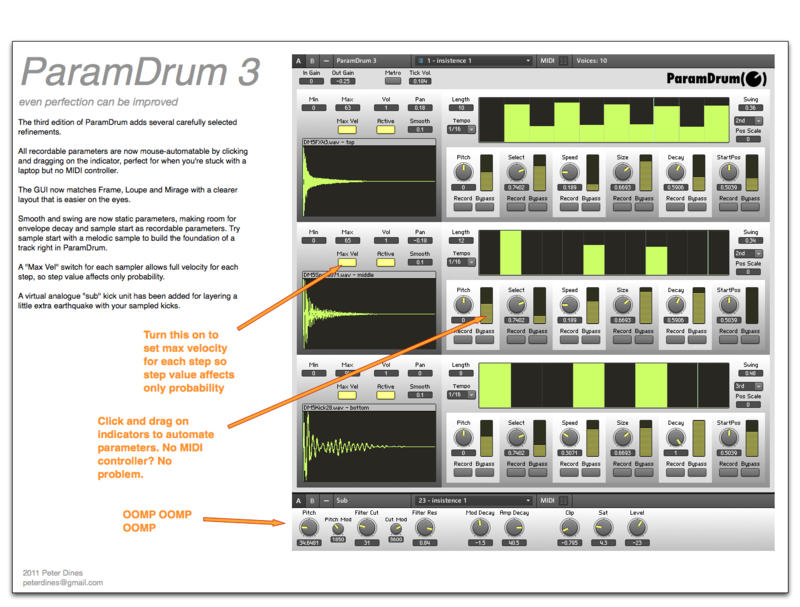 New to ParamDrum and Reaktor instruments? Keep in mind that this instrument requires you to have the full version of NI Reaktor. You must enter a valid email address so I can send you a password for the file. This entry was posted in Downloads, Ensemble, ensembles, Granular, granular sampler, paramdrum and tagged drum machine, drum sequencer, instrument, Parameter Lock, Peter Dines, reaktor, Sampling, TR edition on July 14, 2009 by peterdines.